This stone bridge was built in 1826 to connect the Fachwen slate quarry to the main road from Caernarfon to Llanberis. 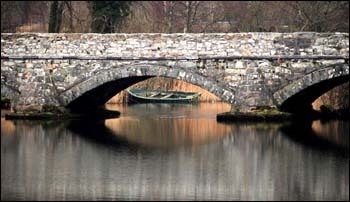 It has four arches and crosses the river Rhythallt, the outlet of Llyn Padarn. Pen y Llyn means “end of the lake”. The bridge was designed by a self-taught engineer called John Hughes, who worked initially as a blacksmith in Penygroes but soon impressed Lord Newborough with his ingenuity and his eye for beauty. Mr Hughes helped to create the water features at Glynllifon, Lord Newborough’s mansion south of Caernarfon, and at one time managed Newborough’s Glyn Rhonwy quarry (to the right of the lake as you look from here). He learned to write in Welsh as an adult, and then learned to write in English to file quarry records. He never became a fluent English speaker. The photo of Pont Pen y Llyn on the right, by Ken Latham, gives you an idea of the structural design and of the decorative touches which would have pleased Lord Newborough. The bridge adapted well to the advent of motorised road vehicles, and has no weight restriction today. Lord Newborough’s quarry at Fachwen (on the left of the lake, looking from here) was dwarfed by the nearby Dinorwig quarry, owned byThomas Assheton Smith. The Fachwen land blocked the shoreline route from Dinorwig to the sea until Lord Newborough sold it. A railway was then built, in 1843, alongside the lake to carry Dinorwig’s output to ships at Y Felinheli. The steam trains of the Llanberis Lake Railway now follow part of that route. Lord Newborough preferred to despatch his slate through the port of Caernarfon, rather than Y Felinheli. Hence he had a road built – including this bridge – to carry slate from Fachwen to the Caernarfon road.